On the publication of Pushkin's first major work in 1820, Zhukovsky presented the younger poet with this famous portrait of himself, over the inscription: "To the victorious disciple from his vanquished tutor." 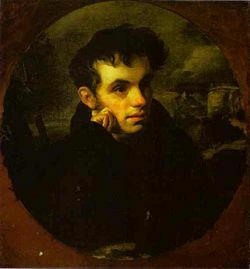 Vasily Andreyevich Zhukovsky (February 1783 – April 1852) was the foremost Russian poet of the 1800s. He is credited with introducing the Romantic Movement to Russian literature. Romanticism in Russia would produce the likes of Alexander Pushkin and Mikhail Lermontov among others. The main body of Zhukovsky's literary output consists of free translations covering an impressively wide range of poets from Ferdowsi to Friedrich Schiller. Quite a few of his translations proved to be more competently-written and enduring works than their originals. Zhukovsky was the illegitimate son of a Russian landowner, Nikolai Bunin and a Turkish slave. He was given his godfather's surname. In his youth, he lived and studied at the Moscow University Noblemen's Pension, where he was heavily influenced by Freemasonry, English Sentimentalism, and the German Sturm und Drang movement. He also frequented the house of Nikolay Karamzin, the preeminent Russian man of letters and the founding editor of The European Messenger (also known in English as The Herald of Europe). In 1802, Zhukovsky published a free translation of Thomas Gray's "Elegy Written in a Country Church Yard" in The Messenger. The translation introduced Russian readers to his trademark sentimental-melancholy style and instantly made him a household name. Today it is conventionally cited as the starting point of Russian Romanticism. In 1808, Karamzin asked Zhukovsky to take over the editorship of the Messenger. The young poet used this position to explore Romantic themes, motifs, and genres. He was also among the first Russian writers to cultivate the mystique of the Romantic poet. He dedicated much of his best poetic work to his half-niece Masha Protasova; his unrequited love for her clouded his personal life for years. His passionate but futile affair with Masha became an indelible part of his poetic personality. As Vladimir Nabokov noted, Zhukovsky belonged to the class of poets who incidentally verge on greatness but never quite attain that glory. His main contribution was as a stylistic and formal innovator who borrowed liberally from European literature in order to provide models in Russian that could inspire "original" works. Zhukovsky was particularly admired for his first-rate melodious translations of German and English ballads. Among these, Ludmila (1808) and its companion piece Svetlana (1813) are considered landmarks in the Russian poetic tradition. Both were free translations of Gottfried August Burger's well-known German ballad Lenore—although each interpreted the original in a different way. Zhukovsky characteristically translated Lenore yet a third time as part of his efforts to develop a natural-sounding Russian dactylic hexameter. His many translations of Schiller—including lyrics, ballads, and the drama Jungfrau von Orleans (about Joan of Arc)—became classic works in Russian that many consider to be of equal if not higher quality than their originals. They were remarkable for their psychological depth and greatly impressed and influenced Fyodor Dostoevsky, among many others. Zhukovsky's life's work as an interpreter of European literature probably constitutes the most important body of literary hermeneutics in the Russian language. When French Emporer Napoleon I invaded Russia in 1812, Zhukovsky joined the Russian general staff under Field Marshal Kutuzov. There he wrote much patriotic verse, including the original poem "A Bard in the Camp of the Russian Warriors," which helped to establish his reputation at the imperial court. He also composed the lyrics for the national anthem of Imperial Russia, "God Save the Tsar!" After the war, he became a courtier in St. Petersburg, where he founded the jocular Arzamas literary society in order to promote Karamzin's European-oriented, anti-classicist aesthetics. Members of the Arzamas included the teenage Alexander Pushkin, who was rapidly emerging as Zhukovsky's heir-apparent. The two became life-long friends, and although Pushkin eventually outgrew the older poet's literary influence, he increasingly relied on his protection and patronage. In later life, Zhukovsky made a second great contribution to Russian culture as an educator and a patron of the arts. In 1826, he was appointed tutor to the tsarevich, the future Tsar Alexander II. His progressive program of education had such a powerful influence on Alexander that the liberal reforms of the 1860s are sometimes attributed to it. The poet also used his high station at court to take up the cudgels for such free-thinking writers as Mikhail Lermontov, Alexander Herzen, Taras Shevchenko, and the Decembrists. On Pushkin's untimely death in 1837, Zhukovsky stepped in as his literary executor, not only rescuing his work (including several unpublished masterpieces) from a hostile censorship, but also diligently collecting and preparing it for publication. Throughout the 1830s and 1840s, he nurtured the genius and promoted the career of the great satirist, Nikolai Gogol, another close personal friend. In this sense, he acted behind-the-scenes as a kind of impresario for the Romantic Movement that he founded. Following the example of his mentor Karamzin, Zhukovsky travelled extensively in Europe throughout his life, meeting and corresponding with world-class cultural figures like Johann Wolfgang von Goethe or the landscape painter Caspar David Friedrich. One of his early acquaintances was the popular German writer Friedrich de LaMotte-Fouquet, whose prose novella Undine was a European best-seller. In the late 1830s, Zhukovsky published a highly-original verse translation of Undine that re-established his place in the poetic avant-garde. Written in a waltzing hexameter, the work became the basis for a classic Russian ballet. In 1841, Zhukovsky retired from court and settled in Germany, where he married the 18 year old Elizabeth Reitern, the daughter of an artist friend. The couple had two children. He devoted much of his remaining life to a hexameter translation of Homer's Odyssey, which he finally published in 1849. Although the translation was far from accurate, it became a classic in its own right and occupies a notable place in the history of Russian poetry. Some scholars argue that both his Odyssey and Undina—as long narrative works—made an important, though oblique contribution to the development of the Russian novel. Zhukovsky died in Germany in 1852 and is buried in the Alexander Nevsky Lavra, St. Petersburg. This page was last modified on 4 April 2008, at 02:42.